Use Superpowers to recreate the back-and-forth struggle between Hero and Villain! Pitting Brawn, Speed, and Wits against one another as you chase mayhem around the city-grid. Super Showdown is a game of outguessing your opponent. Race him to the Mayhem, or trick him with your decoys. Play as the slippery villain, toting the dreaded Ray-Gun and a sharp wit, or the swaggering Hero, boasting superior strength. How well do you know your nemesis? Can you stay one step ahead? 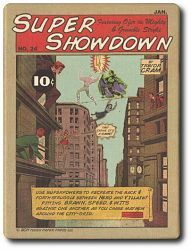 Prove your mettle, settle the score, in Super Showdown, the sensation from a Golden-Age!